I just love it when companies inject cheeky names in their products. 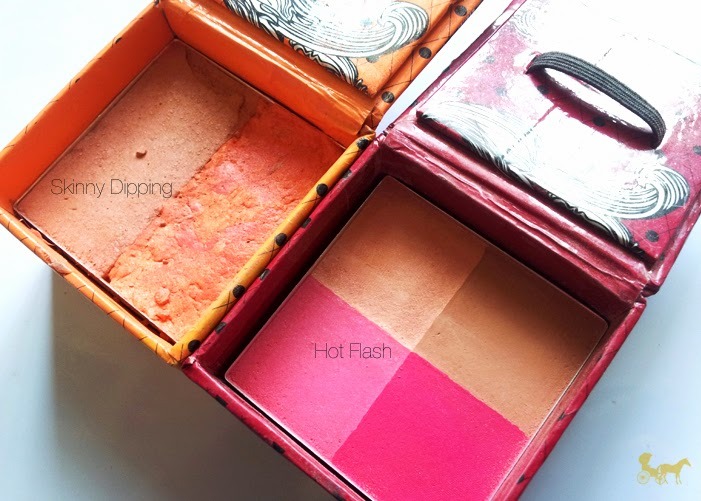 Skinny dipping is by far my favorite blush name, Hot flash...meh not so much. I got these blushes from ebay for around 200Php (approx $5) each and at the time, I was so enamored by all things Benefit, most especially their boxed blushes so seeing a cheaper version on ebay was kinda providential (HA). I figured since it's in a similar format with 1/10249 of the price, might as well give it a whirl. What can I say, aesthetics make up 50% of my purchasing decision. "We ♥ out animal friends. We don't test our products on them"
Now while I love the little snippet of love for out little critter friends, I'm rather wary of its truthfulness. 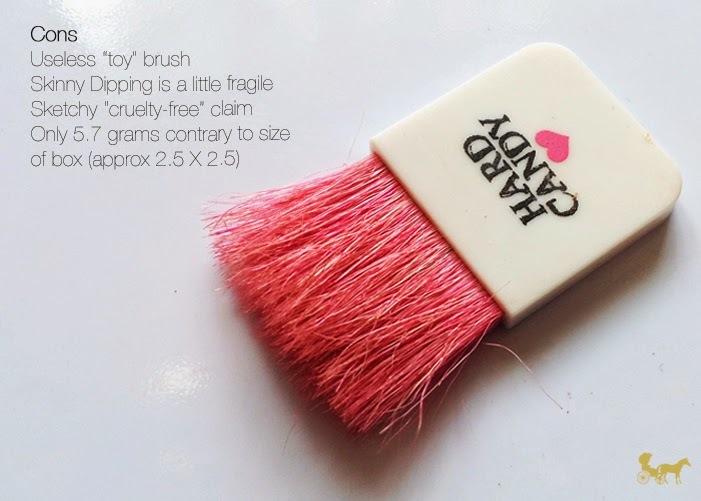 Usually companies that don't test on animals, have the cruelty free bunny on them. And this one doesn't have any on the plastic box it came in nor on the blush box. I was diagnosed with having Butter Fingers, hence the mangled blush which I tried to fix. Like I said, I love the packaging but the box itself is misleading in a way that I thought it contained a lot of product. (I mean it does - contains 5.7 grams. But I was kinda expecting it to be a little deeper. Blame the cheapskate that I am) The way the metal pan is placed inside the blush was flimsy as well. The elastic band on the lid held a brush which I removed because it was utterly useless. The brush was so tiny and the hairs were so thin and sparse it seemed like a prank. Do not be fooled. The hairs are just 1cm thick when flattened. Dishonor on you Hard Candy! Dishonor on your family! Dishonor on your cow! 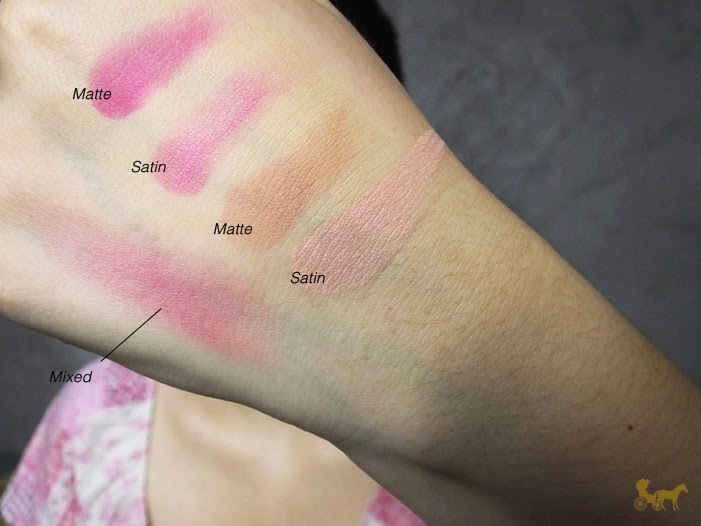 And now for some swatches! I was trying to make the lens focus, but it kept focusing on my face...so there goes my fist. Skinny Dipping has this lovely tangerine that I like. The other one is sort of a mauvey color. Both are satin with silver shimmers in them and blend nicely. Now the mauve, looks extremely natural on me save for the obvious shimmer.The orange one wins for me though -the color is super bright! Here I am wearing a mixture of the orange and mauve and the result is a nice apricot color on my face. The mixed swatch looks different though because I didn't get an equal amount when I swirled my brush. One thing to note is that this particular blush is quite pigmented so swirling around the brush in the pan gets a ton of product on the brush and you only need a little when applying. I personally switched to a stippling brush so there's less product and I can build it up gradually. Hot Flash is more matte overall. The brown one makes for a good eye-shadow too. 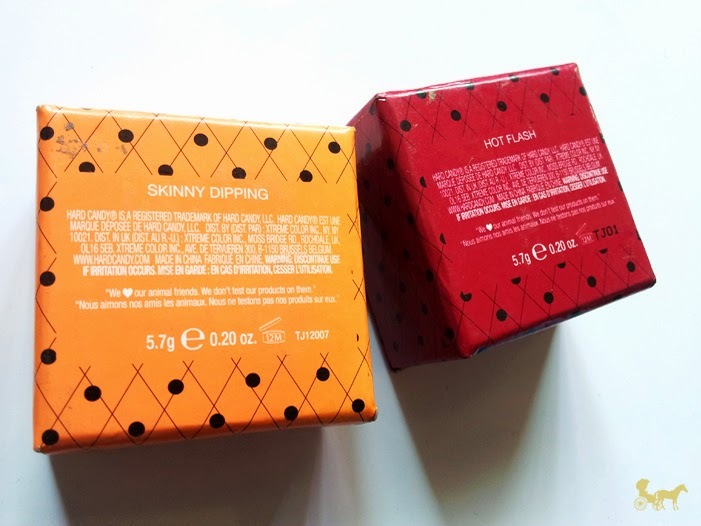 Comparing the 2 blushes, Skinny Dipping is definitely more fragile and powdery (Hot Flashes is a little powdery too) but Hot Flashes has more color combinations. Even after having 2 satin finishes, the final look is still matte. Swirling all the colors, the result is a healthy red-pink blush. It definitely brightened my complexion. I would say this is a little more girly and sweet, and Skinny dipping is a little more healthy and adventurous. Lasting power is ok. Skinny dipping doesn't last as long as I'd like. The shimmers stay though, the pigment is barely there. Are they worth it? Not really. There are definitely better and cheaper blushes out there (Jordana, Ever Bilena, Careline, Nichido, Essence etc) but I'd say it's ok because the packaging is nice and the colors are unique to my collection. 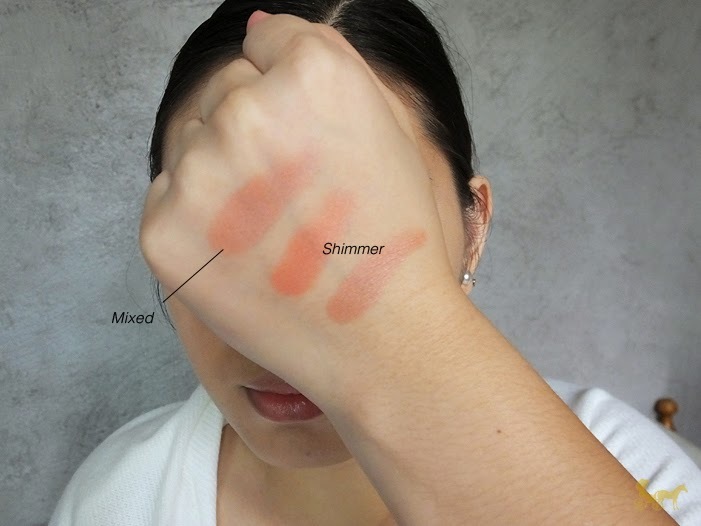 What's your everyday/no-brainer top blush color and/or brand? hahaha i lold at your comments on the brush! 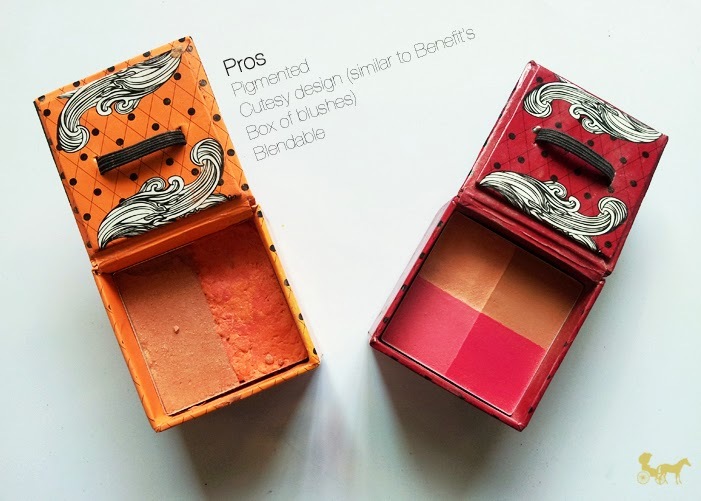 it is super look a like ng benefit blushes packaging. i wanna try Jordana products actually :) where do you buy them here? Haha dishonor for the attempt at trying to fool me. Most online shops have them pero not a lot of variety, usually lip products lang but Dollar stores have them here! Depende sa branch yung mga in-stock nila. I've seen powders, eye pencils, lip pencils and nail polishes. Wait lang, nadishonor yung kalabaw ko :)) Funny CJ!!! 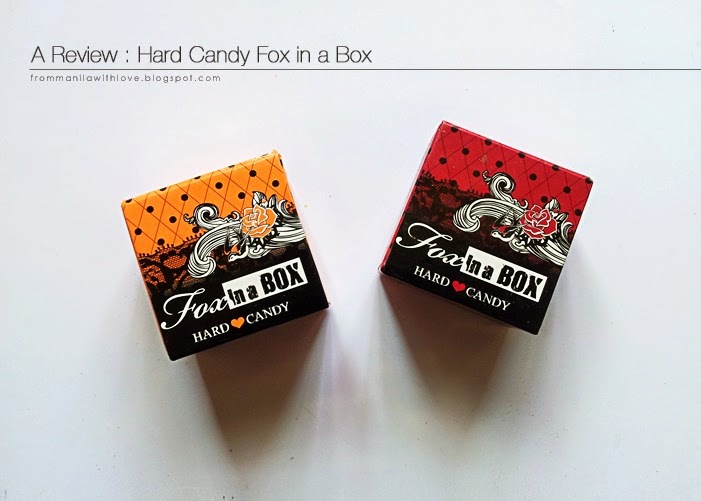 I think this is trying to dupe the Benefit blushes, but they look a bit overpigmented for me. One thing I like about the Benefit boxes is that they're of great blending quality for blushes. You had me at the colour than lost me at your verdict. :'( sad that they have no longevity, I totally had them in my shopping cart but looks like I'll have to remove them now. It does look beautiful on you though! Awww :( It is nice, but if you have oily skin it won't last as long. My bet is 3-4 hours max. It's a very red-pink :) Thanks for dropping by!